Norfolk captain Carl Rogers was left to rue what might have been after rain put paid to his side's Minor Counties Championship clash with Cambridgeshire. 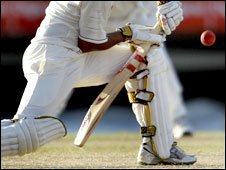 Rogers' men held a 54-run first innings lead in the season opener at March, before the match succumbed to the elements on the third day. The 39-year-old told BBC Radio Norfolk: "It possibly could have been set up for a good match. "If we could have got some early wickets we may have forced a result." After Norfolk won the toss and put the hosts into bat, Cambridgeshire were bowled out for 217. The visitors looked set for a big total in reply after Rogers (96) and Samuel Athurton (69) took the Cambridgeshire attack apart. But a mini collapse restricted them to 271 all out. "With about 30 overs of our innings left I thought we were possibly going to get a lead of 100," Rogers added. "That didn't quite materialise but it's quite difficult for new batters to come in and score on the pitch." Rogers was able to take one plus from the performance though, the debut of left-arm opening bowler Jonathan Miles, who took the wicket of opener Alan Burton. "We are quite reliant on our spinners," said Rogers. "And he does give us something else to work with." Norfolk's next Minor Counties Championship Eastern Division outing is against Cumberland at Barrow on 20 June. Cambridgeshire 217 (Burton 48, Brown 4-38, Walker 3-45) and 66-0 (Burton 34no, Freear 31no), Norfolk 271 (Rogers 96, Arthuron 69, McMahon 7-86).